Make this delicious recipe for a healthy meal idea. It's great to start your day with nutritious healthy meals. Try it out now. 1. Heat olive oil in a skillet over medium-high heat. 2. Add gnocchi in a single layer and cook until browned, about 4-5 minutes. 3. 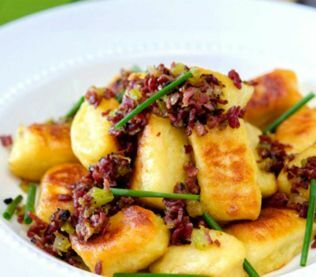 Turn gnocchi and cook, tossing occasionally, until browned to your taste. Add tomatoes and olives, cook for about 2 minutes. Remove from the heat and add pesto and crumbled Feta. Stir. Serve immediately!